Embryonic stem cells are pluripotent and have the capability to differentiate into almost all cell types of the body. Thus, they offer great potential for regenerative medicine such as cell-based therapies and basic research purposes including disease modeling and the elucidation of early developmental processes. In particular, this model system gives us the unique opportunity to investigate early cardiac developmental processes and the molecular origin of related diseases. The vertebrate heart is composed of highly specialized cell types that synergistically interact to control and maintain its appropriate function. The rhythmic beating is generated by a subpopulation of specialized muscle cells located within the right atrium of the heart, the so called sinoatrial node cells. Functional impairment of these cells leads to arrhythmogenic heart diseases with increased mortality risk. A) Isolation and characterization of embryonic stem cells (ESCs) from Shox2-deficient mice. Blastocysts were isolated from heterozygous Shox2 (Shox2+/-) knockout animal matings at embryonic day 3.5 (E3.5), which corresponds to day 0 (0d). The inner cell mass (ICM) of the blastocyst, comprising the pluripotent stem cells, was separated after 5 days (5d) of attachment and expanded for several days (xd). Generated pluripotent Shox2 wildtype (Shox2+/+) and knockout (Shox2-/-) cells were characterized in detail. B) Differentiation and expression profiling of Shox2 embryonic stem cell-derived sinoatrial node cells. For differentiation the conventional ‘hanging drop’ protocol followed by embryoid body (EB) formation was applied (0d – 7d). On day 7+1d sinoatrial node cells were enriched via ‘Fluorescent activated cell sorting’ (FACS) using the cell surface marker CD166 and expression profiles were assessed by nCounter analysis, a technique which allows digital counting of nucleic acids. The coordinated action of defined transcriptional networks is crucial for the development and function of the sinoatrial node. Shox2 represents one of the major genes involved in these processes and is mandatory for the generation of a normal heart beat. In humans, mutations in the SHOX2 gene have been linked to early-onset atrial fibrillation, the most common cardiac arrhythmia. Atrial fibrillation often coexists with impaired sinoatrial node function in patients. However, the underlying molecular mechanisms are complex and still not fully understood. To provide a suitable research system for unravelling the underlying mechanisms in health and disease, we established an embryonic stem cell-based model using Shox2 as a molecular tool. 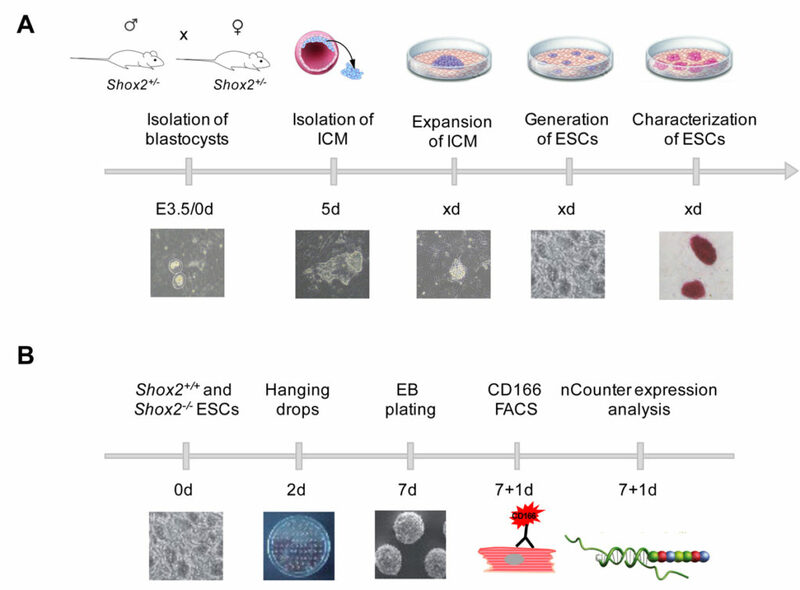 To establish this model system, Shox2 wildtype and knockout embryonic stem cells were isolated from Shox2-deficient mice and the pluripotent character of undifferentiated stem cells was confirmed in detail (Fig. 1A). The generated cells were differentiated into various cell-types including cardiomyocytes according to a specific protocol, termed ‘hanging drop’ (Fig. 1B). Therefore, embryonic stem cells were cultivated in droplets to form cell aggregates, so called embryoid bodies, leading to multicellular differentiation. To enrich cardiomyocytes of the sinoatrial node subtype, cells were selected via ‘Fluorescent activated cell sorting’ using the fluorochrome-labelled cell surface marker CD166, which is specifically but transiently expressed in the developing sinoatrial node. Expression analysis of cell subtype-specific marker genes revealed efficient enrichment of sinoatrial node cells. Subsequently, comparative gene expression analysis of Shox2 wildtype and knockout sinoatrial node cells was performed. Several genes important for heart beat initiation and propagation were differentially expressed in Shox2 knockout cells, confirming the specificity of our established model system. We also identified Nppb, a well-studied marker in cardiovascular disease, as a novel putative Shox2 target during differentiation in embryonic stem cells. Differential expression of Nppb could be confirmed in heart tissue of Shox2 knockout mouse embryos. Mutations in the SHOX2 gene have been previously linked to atrial fibrillation, the most common arrhythmia in humans. In turn, elevated NPPB levels have been detected in patients with atrial fibrillation. These and other data suggest that our generated embryonic stem cell model represents a new system to investigate the underlying molecular mechanisms under physiological and pathophysiological conditions and for evaluating novel therapeutic approaches. Comparative expression analysis of Shox2-deficient embryonic stem cell-derived sinoatrial node-like cells.